During the 1870s, Boston architect Henry Hobson Richardson captured the American imagination with rugged, dynamic buildings built in the Romanesque Revival style. He became so famous for his Romanesque architecture that the style is often called Richardsonian Romanesque. They were called "Romanesque" because they had wide, rounded arches, resembling the structures of ancient Rome. These buildings were constructed of rough-faced, square stones and had round towers with cone-shape roofs, giving them a distinctly castle-like look. The heavy Romanesque style was especially suited for grand public buildings. However, with their massive stone walls, they were expensive to construct. 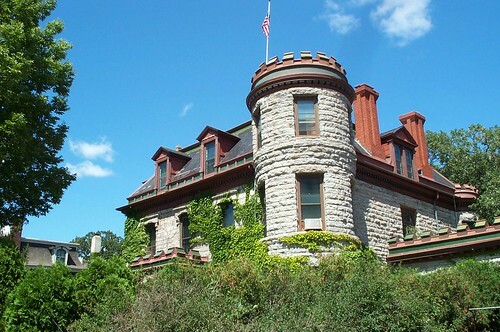 Only the wealthy adopted the Richardsonian Romanesque style for private homes, like this 1883 home on Summit Avenue in the Summit Hills neighborhood of Saint Paul, MN. Because of the expense of these homes, Romanesque Revivals were popular only briefly and few were constructed after 1900.